It wasn't really that long ago that we fell in love with a Fargo 4x6 dye sub printer. Some of those 4x6 prints are still around but most of them have faded quite a bit. Somehow in the intervening years, inkjet technology has outrun dye sublimation printing, providing less expensive but longer-lasting prints. 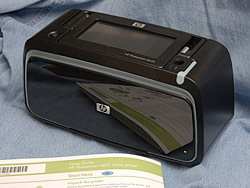 And HP has been at the forefront of inkjet development. 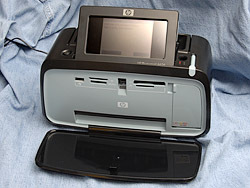 The A626, HP's new $179.99 compact printer, invigorates the best of its compact technology with a touch-screen transfusion. The very large LCD is a window into some smart firmware with loads of bells and whistles. Making the most of its three color ink cartridge, it can produce both 4x6 and 5x7 prints. If you like to have prints from your camera, this is a great little print factory. And you can take it with you, too. Let's take a closer look. HP A626. Closed up with install poster. Feature Number One is the compact size of this inkjet printer. It looks like a small boom box. That's too big for a briefcase but with its own handle, you can just carry it. 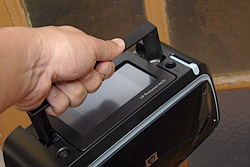 Or pack it in one of HP's $30-35 compact printer carrying cases. Don't forget the small power brick, though. 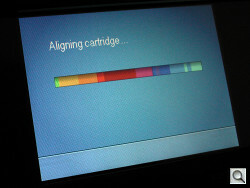 The single ink cartridge, an HP 110 tricolor filled with Vivera ink, is pretty compact, too. The three colors are cyan, magenta and yellow. No black, folks. No light magenta, no light cyan, no green, no photo gray. And yet the prints stand up well to the competition. One Cartridge. Three inks: cyan, magenta, yellow. Feature Number Two is page size. This compact printer can do both 4x6 and 5x7 prints (along with panorama prints and post cards). Being able to print 5x7 is a real plus. Feature Number Three is the 4.8-inch touch screen interface. It's easy enough to navigate (we never got lost and always found the icon we needed to do what we wanted) but it also provides a lot of animated help that's very welcome. Which leads us to Feature Number Four: the firmware. There's about 200 graphics and frames you can add to your images, not to mention captions (from an on-screen keyboard) and drawings (using the included stylus). Usually this stuff is just fluff but I found much of it useful. Drawing on the screen is pretty crude (you can't manage a signature, really) but sometimes all you need to do is circle something. Too bad you can't save these edits, but at least you can do them. Paper Tray. The blue-gray stop at bottom adjusts for 4-inch or 5-inch wide paper. There's more to the firmware than that, though. HP's Photo Fix brightness and contrast enhancements are helpful for images that don't pass through an image editor. You can also get rid of red-eye and indulge in HP's slenderizing distortion, which makes everybody look thinner. Paper weights: 16 to 24 lb. and HP photo papers up to 75 lb. Back. The power cord connection is just below the USB cable connection. No USB cable. No Bluetooth adapter. Not much ink either (don't leave the store without a spare cartridge). Although we couldn't find any evidence of it, HP claims there is an optional battery pack capable of 75 prints per charge. Compatible operating systems include Windows XP Home, Windows XP Professional, Mac OS X v 10.3.9, Mac OS X v 10.4. 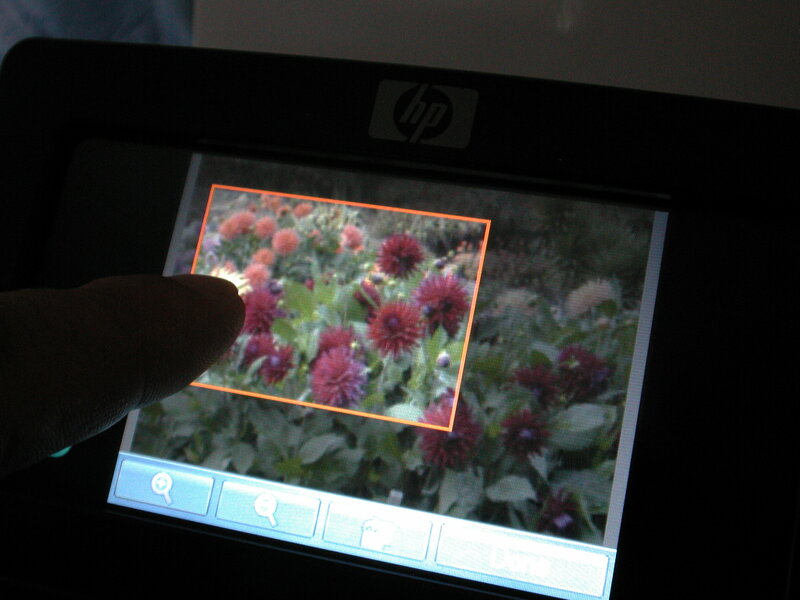 The HP A626 is also certified for Windows Vista, no small feat. Requirements for Windows XP (Home, Professional, Professional x64) include: any Intel Pentium II, Celeron, compatible processor, 233 MHz or higher; 128MB RAM; 350MB hard disk; CD-ROM; USB; Microsoft Internet Explorer 6.0, Adobe Acrobat Reader 5; Windows Vista: 800 MHz 32-bit (x86) or 64-bit (x64) processor; 512MB RAM; 900MB hard disk; CD-ROM; USB; Microsoft Internet Explorer 7.0, Adobe Acrobat Reader 5. Requirements for Mac OS X v 10.3.9, 10.4 include: Intel Mac; PowerPC G3, G4, G5 or Intel Core processor; 128MB RAM (256MB or higher recommended); 150MB available hard disk space for software installation; SVGA 800x600 monitor with 16-bit color; CD-ROM; available USB port and USB cable; Adobe Acrobat Reader 5, any Web browser. HP includes a poster-size Setup Guide that gets you going in seven simple steps. Animated Help. Shows you how to install the cartridge. Alignment. The big screen keeps you posted. Unpack the printer. This is often more difficult than it should be, with protective tape securing delicate parts for shipping. But the A626 was easy to unpack. Mostly the protection is for the shiny plastic surfaces (why doesn't someone make a bruiser of a printer with unscratchable material?). Do make sure to remove the protective sheet from the LCD so you can follow the bouncing ball. 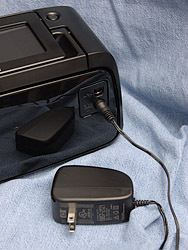 Plug in the power adapter to a wall outlet and then to the back of the printer. Press the Power button to start it up. It plays a charming little tune. Pick your language. It's your first chance to use the touch screen. Don't be shy, it's fun! Cartridge Installed. Push it all the way in until it locks. Calibration Sheet. It's the first thing you print. 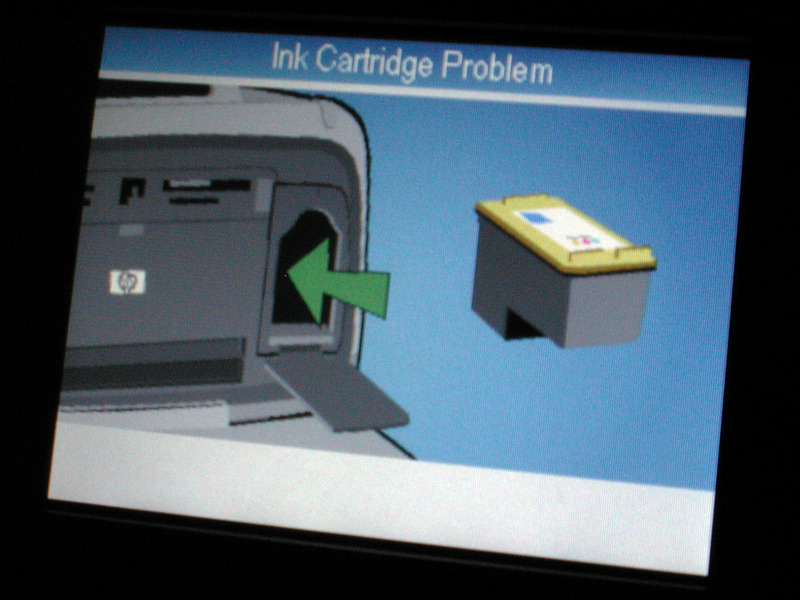 Install the print cartridge. 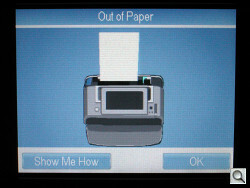 The printer can actually show you how on its LCD. No need for the manual or those hard to read illustrations. Just watch the animated presentation and replay it as often as you like. 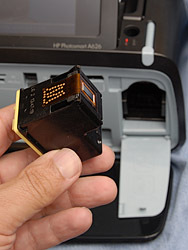 Mainly you want to make sure you take the tape off the cartridge's contacts and push the thing all the way into the printer until it snaps into place. Load photo paper. When you open the big front output tray, the small back input tray also opens and the LCD pops up, too (pinch the blue-gray tabs on the side of the LCD toward the front to close the LCD). Drop some paper in there with the glossy side facing the front of the printer. Align the paper to the power connection side and push the blue-gray paper width guide up against the other side of the sheet. 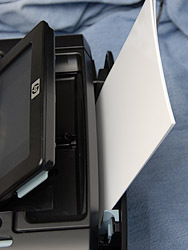 The printer can handle two widths of paper, so you have to set the guide when you change widths. You can extend the little blue-gray paper support to help stand up the 5x7 sheets. Print your first photo. Well, print the alignment sheet, anyway. Then pop a memory card into the printer and watch them come up on the screen. Tap one and then tap the print icon to start printing. Get creative. Built into the A626 are several ways to customize your print. You can add decorative frames, draw on the image with the included stylus, apply color filters and text. You can optionally attach a USB cable to the back for a computer connection, a Bluetooth adapter to the PictBridge port or a camera or thumbdrive to the PictBridge port. And you can insert everything but a SmartMedia card into the card reader. The software CD installs about 169MB of stuff (on the Mac version at least). We're not nearly as annoyed with HP's printer software architecture as we are with their all-in-one architecture, but both could be simpler. After installing the device driver, the installation routine goes on to such things as the IO Core, PhotoLink Support, Setup Assistant, Registration Assistant, Photosmart Mac Core, Photosmart Mac, iPhoto compatibility, Software Update, Uninstaller, Dvice Counters, Help, CUPS drivers, Ink Widget, Utilities, Device Monitor, Queue Creator and more. Yes, it has its own software update routine. It reported an error downloading the update when we ran it, though. Not very reassuring. 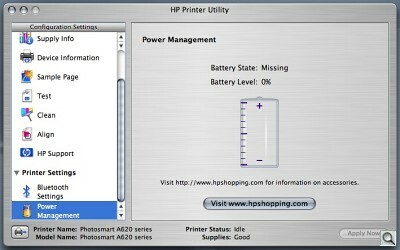 Photosmart Mac is a set of HP applications (Create, Edit, Print, Share, Stitch, Studio). Print, for example, lets you open an image and send it on to the printer. No options, though. Ink Levels. It goes fast. Bluetooth Settings. We left them alone. Power Management. Check your battery. 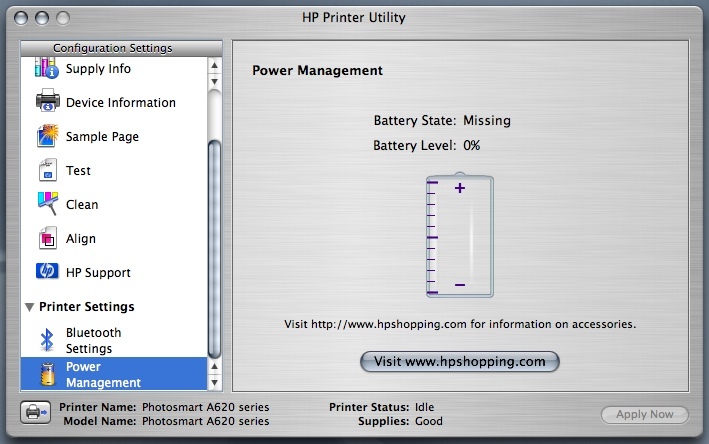 HP builds its own little printer world, which starts with the HP Device Manager. The Device Manager lets you select a printer and execute a task. 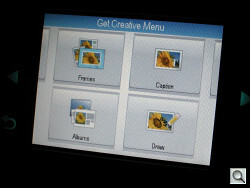 With the A620, for example, the task list includes Transfer Images because the printer has a card reader. You can also access the Setup Assistant, maintenance, registration, updates check and uninstall routines from the Information and Settings popup menu. 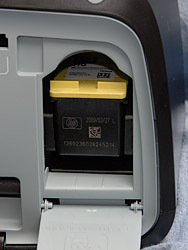 The Maintenance Utility lets you check the ink cartridge's status (here it's half empty or half full, depending on your employer), Bluetooth setup and battery condition. Editing Brightness. Just touch the scale. Creative Menu. Frames, Caption, Albums, Draw. Crop. Just push the crop around after resizing it with the button below. Draw. Fill colors are limited. Card Reader. 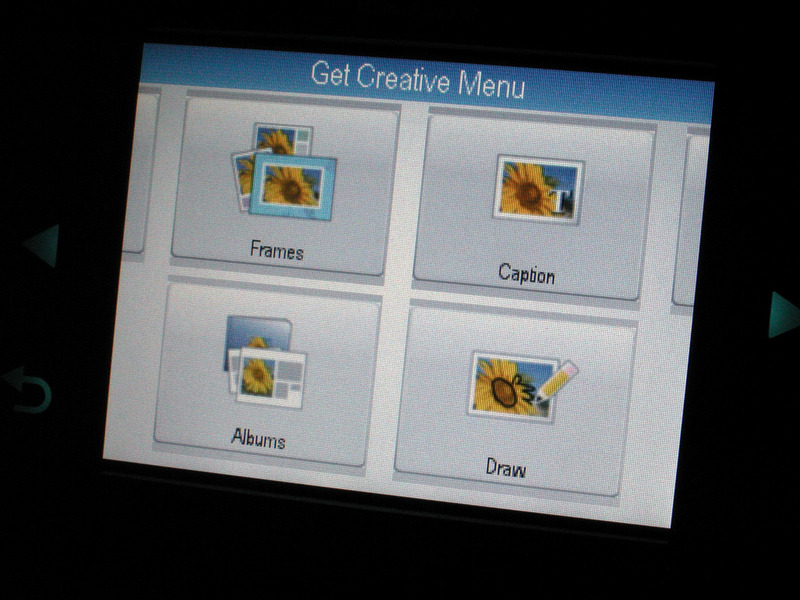 We copied some images into a subdirectory of an SD card and popped it into the A626. It displayed them correctly and we spent an hour or so printing our favorites and playing around with some of the creative options. We thought we'd pop the same card into the Kodak 5300 to make some comparison prints, but the 5300 couldn't read any but the first image on the card. There's probably an explanation but, well, HP doesn't need one. I printed some borderless 5x7s in about two minutes each. I edited a few of them using the built-in editing options, usually just changing the brightness. 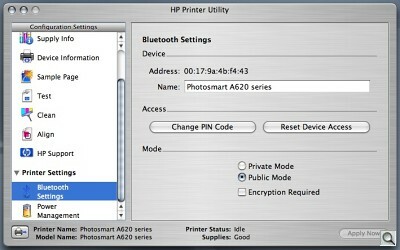 All of them were run through HP's Photo Fix enhancement routine, which you can disable from the Preferences screen. I also tried a few borders and added some type to them. If the image file was large, this was often a bit sluggish compiling the border image with the photo. Computer. We had no trouble printing from our usual applications and HP's Print program. We made a USB connection to the printer but we also used a Bluetooth connection. The A626 was easily found and we sent an image file to it which printed with no problem. This was the least fun we had with the A626, actually. We actually missed the touch screen. Bluetooth. Bluetooth printing was a snap. You do need a Bluetooth adapter. 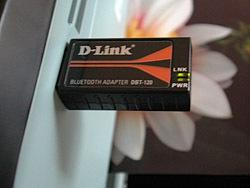 We used a D-Link, plugged into the PictBridge port in front. HP does sell a more expensive adapter but anything will do, really. BT Adapter. We used a D-Link successfully. Then we found a picture we liked on our Razr cellphone, went to the menu to select Copy and the Razr looked around for a device, found the HP and sent it off. 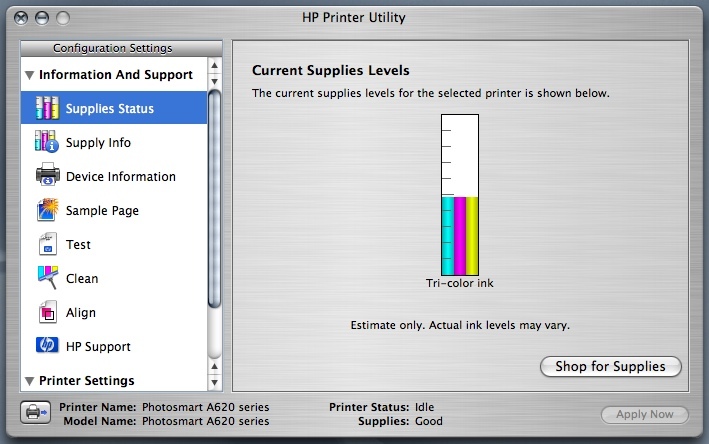 We hadn't put any paper in the printer, but the HP calmly suggested it was the bright thing to do. When we'd loaded the paper and tapped the onscreen OK button, our print came out. Considering what we threw at it, the A626 impressed us with its robustness. It read our cards and thumbdrives. It printed without complaint via Bluetooth, PictBridge, USB and the card reader. The A626 might be more fun at a party than a punch bowl. 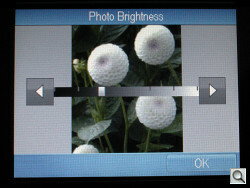 Camphones can Bluetooth to it and digicam users can pop their cards into it. That just leaves the cost of consumables to the host. The cost of consumables is the cost of paper and ink. HP doesn't really offer any options for the A626, since you're locked in to the Vivera dye-based inks in the 110 cartridge. Out of Paper. Ouch. But just tap the Show Me How button for instructions. Using a porous paper like HP's Advanced Photo paper provides instant dry and water resistant performance. But with dye inks, porous papers produce very short-lived prints. The problem is ambient ozone exposure, as Henry Wilhelm of Wilhelm Imaging Research (http://www.wilhelm-research.com) explains in his report on the permanence of all types of 4x6 prints (http://www.wilhelm-research.com/ist/WIR_IS&T_2007_03_HW.pdf). You can get color prints that will last up to 105 years using HP's swellable Premium Plus photo paper. They aren't instant dry or water resistant, however. 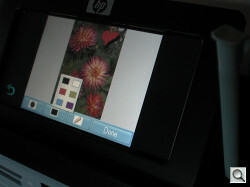 HP claims its Premium Plus Photo paper is "dry to touch soon after printing. Recommend wait 7 days before inserting into album or under glass cover. Keep unused paper in the plastic bag and reseal the box. Store the packaging flat, in a cool place." Not bad advice. For our testing, we used HP Advanced Photo paper but we'd stick to Premium Plus for anything we wanted to last on a refrigerator door. 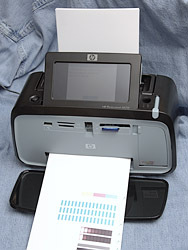 Right out of the printer, the instant dry HP Advanced Photo paper print is tacky but you can't leave fingerprints on it. We ran the corner of a fresh print under the tap for a minute and we could see that the tone had darkened after it dried, but very little. Water resistant, indeed. 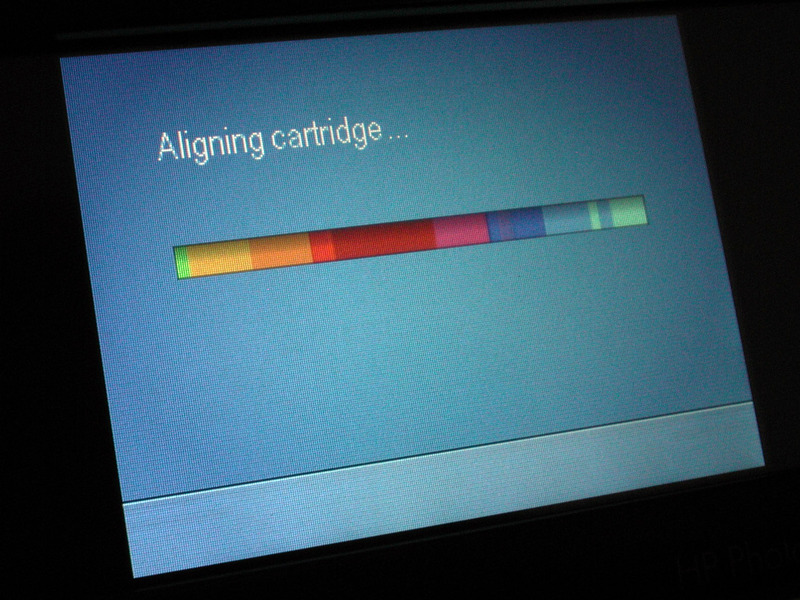 Only one ink cartridge is supported, the tricolor 110 with cyan, magenta and yellow inks. The 110 ink cartridge lists for $20 but can be found online for under $17. HP Premium Plus Photo paper is available in 100 sheet packs in the 4x6 size for about $22. HP also bundles paper with ink in value packs like the HP 100 Photo Pack 120 Sheet for about $45, which runs about 38 cents for each 4x6. Not much difference from buying the paper and ink cartridge separately. Handle. We were tempted to take it home. That's more expensive than what Kodak claims for its new all-in-one pigment printers. And those do include a black ink. But Kodak has three different quality levels, starting with a 10 cent 4x6 on flimsy photo paper, a mid-level 4x6 at 15 cents and a 25 cent print on heavier photo paper. Oddly enough, in side by side comparisons, we had a hard time telling which print we liked best. The Kodak had deeper shadows and more contrast but the HP prints held their own, particularly in dim room light. Where the HP prints had trouble was in low key subjects but flesh tones and brighter colors looked very good. The good news is that both prints exceeded what we'd expect from a lab. And we didn't have to work to get that level of quality. It just came naturally to the A626. 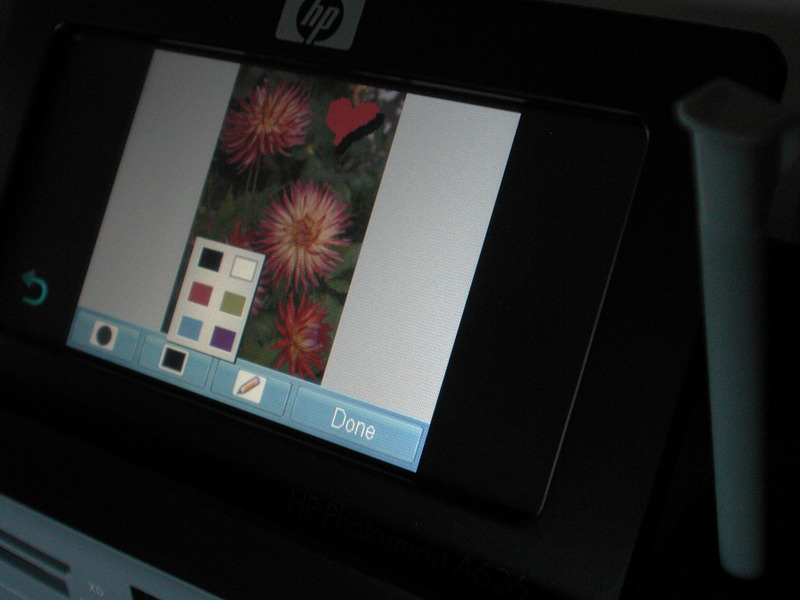 Even though they're inkjets not dye sub printers, we're fond of HP's compact photo printers. Toss some paper in the slot on top, pop in your card (or plug in your camera) and presto, you've got prints. They can do a lot of other tricks (like add captions and titles or remove red-eye) but all you really need sometimes is an appliance not a power tool. I like the little A626 inkjet. Yes, it only uses three inks -- and you can tell in the shadows (no black). And only swellable paper will do (with those dye inks). But the touch screen interface is terrific, it prints 5x7s and Bluetooth (if you have an adapter) is a nice bonus, too. Not too shabby.